Author: Christine Waag. Series edited by: Anne Storch, Norbert Cyffer, Franz Rottland †, M. Lionel Bender †. The present study is an extensive description of the Fur language with emphasis on the verb. The Fur language is spoken in the western provinces of the Sudan, called Darfur (‘house (of the) Fur’). It was the lingua franca of that area before Arabic became predominant. Despite its historical and geographical importance, this language has not previously been studied and described in depth. It is not clear where to place this language within the Nilo-Saharan phylum. The present book may assist in reviewing the classification of Fur as well as in the research of other languages of the area. It deals with different grammatical domains and makes use of current linguistic theories and methods in describing the interesting features of the phonology, morphology, clause, and sentence structure. The introduction includes information about the Fur people and its history as well as an introduction to the language itself. 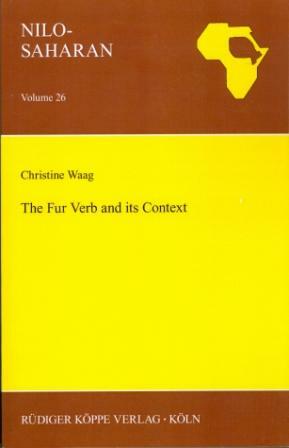 The first main chapter deals with the phonology of Fur. After an introduction of the sound system and the syllable structure, vowel harmony is discussed in detail. Fur has an interesting combination of [ATR] harmony with height harmony. Another section is dedicated to tone, which is lexic­ally as well as grammatically very important in the Fur language. In the final section of this chapter some patterns at morpheme boundaries are discussed. Chapter 3 introduces the different word classes as they form the elements of a clause. These include nominals, verbal elements, and others. The nominals are marked for case and include nouns and noun phrases as well as quantifiers, demonstratives, and pro­nouns. Chapter 4 presents the complex verbal morphology as well as lexical features like valency. The morphological forms include affixes and clitics. After an overview of the inflectional features, reference markers of subject and object, aspect, tense, and modality are discussed. The affixes are sorted into classes according to their forms. Furthermore valency and valency changing features as well as motion verbs are described. The final main chapter, examines the clause and sentence structure. These are strongly governed by discourse or pragmatic relations. Word order in Fur is connected to information structure rather than to the morphological marking of subject and object. Then the roles of the constituents are expressed. The key factor in the marking of the roles is transitivity. The notion of transitivity is explained as well as the forms used to express it in the Fur language. The next section deals with structures of more than one word which express verbal meaning. Finally, different clause types and the way in which they form sentences to express logical relations are presented. After the conclusion, there is an appendix with several examples of verb tables and four texts. The verb tables include the paradigms available for the verbs presented here.